The Sarasota city commissioners have chosen the city’s second piece of roundabout art. And once it is installed, it seems reasonable to say it will certainly be visible. Like the first sculpture, Embracing our Differences, which was approved last month for the recently completed roundabout at Orange Avenue and Main Street, the second piece of art will be larger than life-size. It is planned to be 25 feet tall (including its base) and 23 feet wide at its point of greatest girth. On Monday evening, Nov. 2, the City Commission approved the sculpture, called Flow, as the centerpiece for the multi-lane roundabout to be built at Gulfstream Avenue and U.S. 41. Commissioners did raise questions about how the piece will blend in with the two other large bayfront sculptures, Unconditional Surrender and the modern, red Complexus. They also debated whether its stainless steel design can be made less reflective. Vice Mayor Suzanne Atwell agreed and the resulting vote was unanimous in support of Flow. Plans call for the sculpture to be created on the east coast of Florida and brought to Sarasota by the end of 2016. It will be installed in a temporary location before it is moved to the center of the Gulfstream roundabout, which is an estimated six to eight years away from completion, said City Manager Tom Barwin. Flow was offered to the city as part of The Vue Sarasota Bay and Westin’s public art donation. Sculptor Claudia Jane Klein said her goal in the design was to draw on the energy of the water in nearby Sarasota Bay and the Gulf of Mexico. Klein — along with David Smith, the city’s general manager for integration; David Errant, a representative of the developer; and Public Art Committee member Elizabeth Van Riper — sat before a 3-foot-tall model of the sculpture during the Monday presentation to the commissioners. 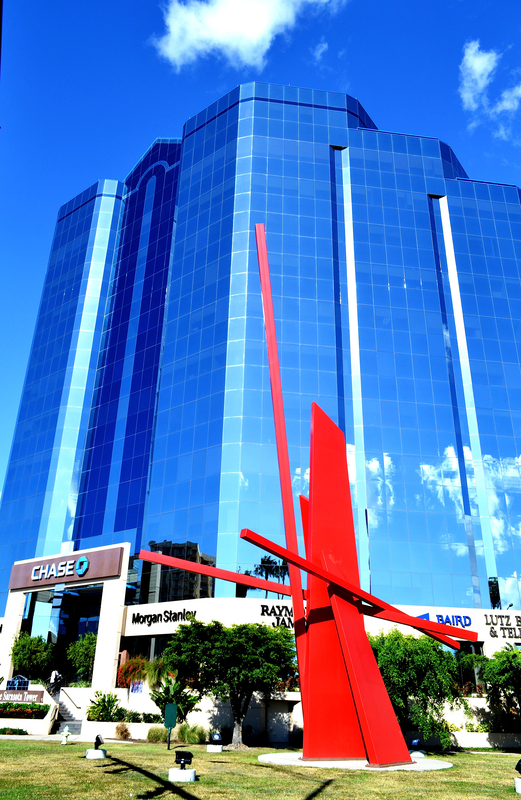 The development team for The Vue decided that a three-dimensional artwork in the roundabout would be a “wonderful opportunity” to meet the project’s public-art requirement under the guidelines of the city’s Downtown Community Redevelopment Area (CRA), as indicated by the presentation. The total developer contribution for the sculpture, including installation, is $250,000. David Arnet, the Kolter Group’s project manager for The Vue, said he hopes to see Flow standing in a temporary location by the end of 2016, when The Vue is slated for completion. 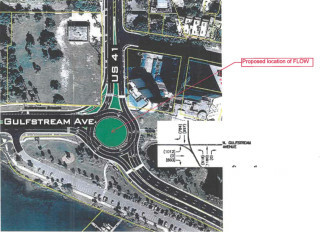 Commissioner Susan Chapman suggested that Luke Wood Park, which borders the Senior Friendship Center and U.S. 41 near downtown Sarasota, be considered the home for Flow until the roundabout is ready to greet traffic. Chapman said she envisions a meandering sculpture garden in Luke Wood Park; serving as the temporary site for the sculpture could jump-start that vision, she noted. In addition, Luke Wood Park offers good potential for community residents and the commissioners to see how the sculpture will function adjacent to moving vehicles, she pointed out. “It is similar to a roundabout in that it is a confluence of all these roads,” Chapman said of the park’s location. A site on the bayfront could be another possibility, Smith noted. At a total height of 25 feet — 19 feet for the sculpture plus a 6-foot-tall base — Flow will be similar in size to the Unconditional Surrender sculpture. 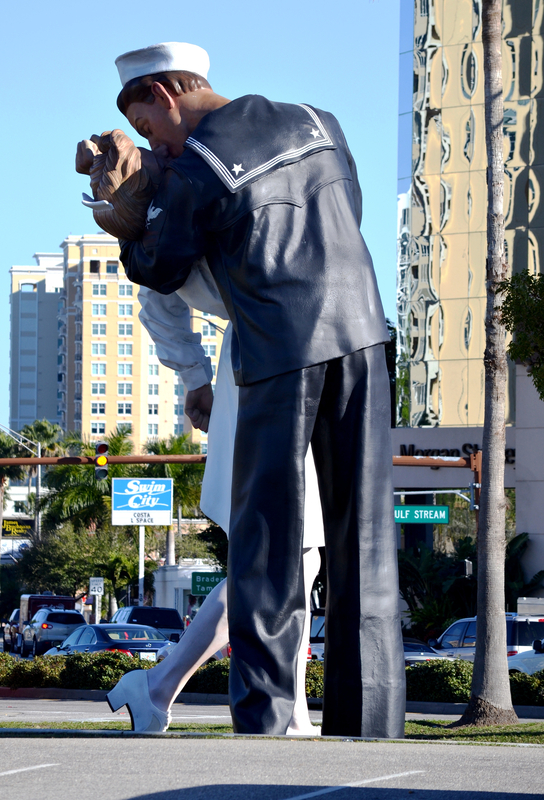 That artwork, which was modeled on the famous V-J Day photograph of a sailor kissing a nurse, stands 26 feet high. Barwin noted that the Florida Department of Transportation (FDOT) is continuing to work on the design for the roundabout, and it is considering allowing vehicles to exit from downtown onto Gulfstream Avenue. If the department opts for the latter traffic pattern, that could necessitate a change in the location of either Complexus or Flow. 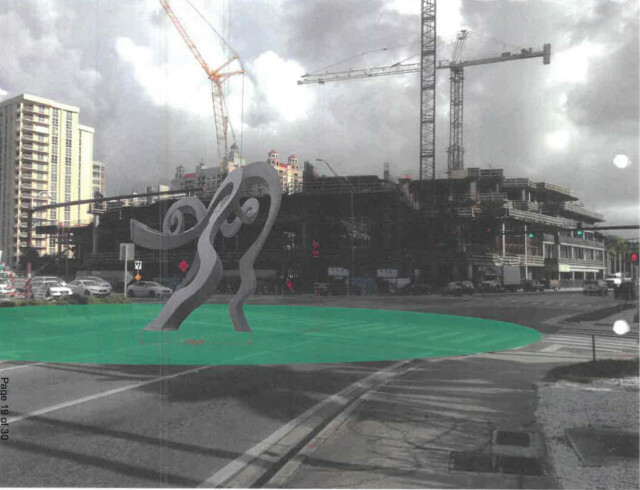 Monday’s vote at least clears the way for city staff to begin to coordinate with FDOT on placement of the sculpture in the proposed roundabout on U.S. 41, which is a state-managed roadway, Smith said. The height of the artwork, with its base, meets the department’s maximum allowable height of 25 feet, he added. But the sculptor’s original stainless steel mirror finish might have to be altered, he said, because FDOT does not allow anything that might compromise drivers’ vision on a highway. The proposal came before the City Commission early to allow city staff and the artist “time to work with FDOT,” Smith pointed out. Chapman asked Klein for details on whether, and how, Klein could change the sculpture so it is not too reflective of light and heat, especially in the strong afternoon sun. “The choice of actual finish can go from … highly reflective … all the way down to a matte finish, without sacrificing the quality of the stainless steel and/or the presence of the sculpture,” Klein responded while holding a piece of mirrored stainless steel. Thus, using a different type of polish easily can result in less reflectivity, she said. There will be more sculptures, in due time. A different process will be employed for the selection of future roundabout sculptures, she continued. The city will issue a call to artists, and the person selected will discuss the project with the Public Art Committee as well as the City Commission. 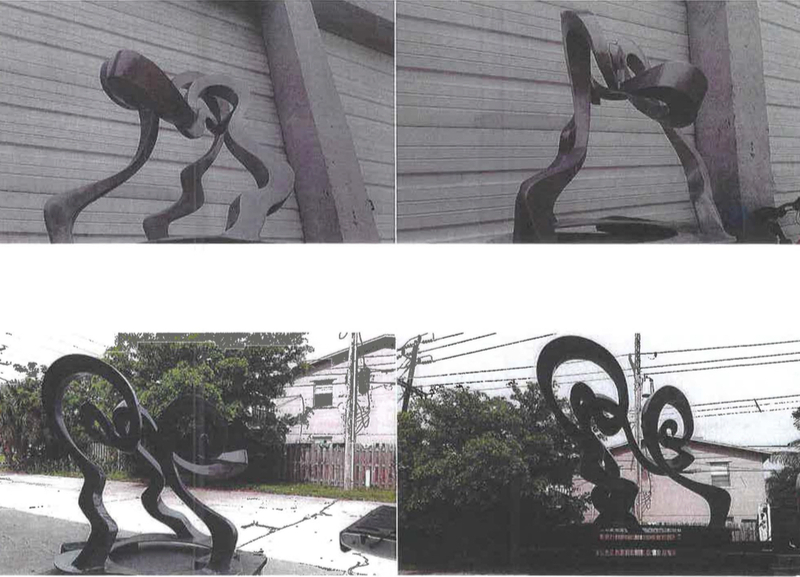 The first two roundabout pieces, however — Flow and Embracing Our Differences — were chosen differently because they were the result of private developers donating public art, Smith pointed out. One facet that will remain the same is that the other roundabout sculptures on U.S. 41 also will be installed atop 6-foot bases, a decision the commissioners previously made. The design of the base would be up to FDOT, Smith added. “Our long-term objective is to put a call to artists,” Van Riper told the commissioners. “We are in the process of building criteria for a call for artists for further pieces. But all of it is dependent on FDOT’s protocol, dimensions and requirements. Each of those will be different depending on the unique roundabout,” she noted. “But the real standard that we are looking for is museum-quality art, not to be defined by genre but to be defined by the artistic value of the piece,” Van Riper said, adding that she believes Flow is a big step in that direction.